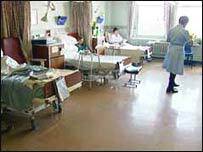 Hospitals could be held criminally liable if patients catch superbugs such as MRSA, Health Secretary Patricia Hewitt has warned. She told ITV1's Dimbleby Programme the government is looking to make current laws stronger to deal with the threat. Factories face stiffer hygiene controls than hospitals and visitors must help keep bugs out, she said. The former trade and industry secretary added that private firms could be given a greater role in running the NHS. On the MRSA issue, Ms Hewitt said the government was "looking at" holding hospital bosses criminally responsible for bugs such as MRSA. She said: "We need a much stronger legal framework and we'll be consulting on that in a couple of months' time. "We can't have a situation where we've got tougher hygiene laws and standards in food factories than we have for people who are very, very seriously ill in hospital." She said it would be "absurd" to force everyone on a routine visit to hospital to wear gloves and masks, but she said visitors had a responsibility. Ms Hewitt caused controversy last week when she announced private providers would be carrying out an extra 1.7 million operations for the NHS over the next five years, at a cost of £3bn. She told the Dimbleby Programme the private sector could also play a bigger part in primary care. Ms Hewitt said there was nothing wrong with giving the private sector a greater role in the NHS. She said: "We're bringing the private sector in where we need them - to give us more capacity and get those waiting lists down, but also to give us even more innovation than we've already got." Why has MRSA dominated the headlines?